1 Peel and finely chop garlic. Rinse chicken breasts, pat dry, rub with the garlic, sprinkle with cilantro leaves and drizzle each with 4-5 tablespoons soy sauce. Cover with foil and let marinate 30 minutes. 2 Rinse bell peppers, halve, remove seeds and ribs, quarter and cut into thin strips. Rinse, trim and cut scallions crosswise into rings. Peel ginger and cut into thin slices. 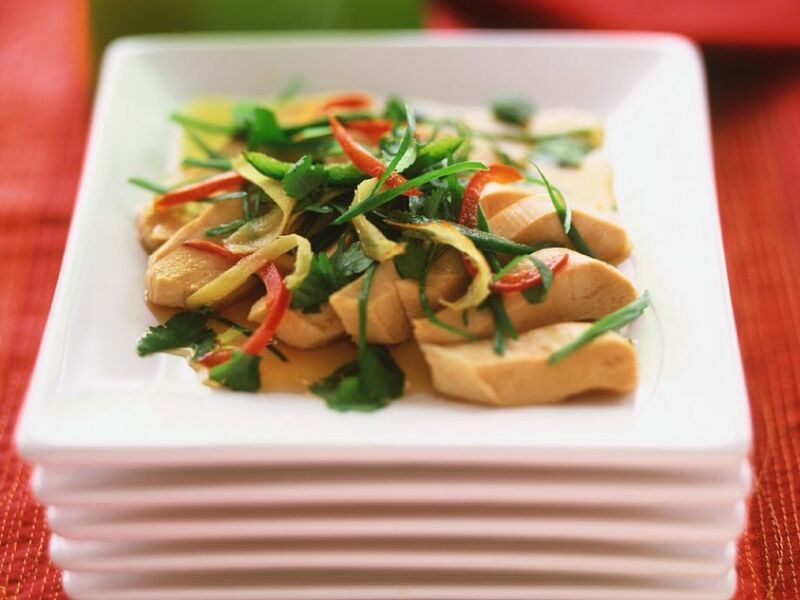 Drain bamboo shoots and cut into thin strips. In a pan, heat 2 tablespoons sesame oil. Add chicken breasts with marinade, cover tightly, and cook over low heat, turning once, about 15 minutes. When chicken is cooked, lift out of the pan and cut into thick strips. Pour pan juices over chicken and set aside. Heat 2 tablespoons oil in the same pan. Add peppers, bamboo shoots, scallions and ginger and sauté, stirring, over medium heat, about 5 minutes. Return chicken to the pan and mix with vegetables. Transfer to an Asian-style dish. Rinse cilantro, shake dry and chop coarsely. Serve chicken and vegetables topped with cilantro.